Screen printing or silk screening is a printing technique particularly suited for flat or relatively flat surfaces. The heart of the process involves a fine mesh or screen that is tightly stretched around a rigid frame. The areas that are not to be printed are masked out on the screen, and to create the print, the framed screen is positioned over the item to be printed, along with a dollop of thick ink. A squeegee is then used to press the ink through the screen. The masked areas prevent ink from passing through, but the umasked areas allow the ink to be imprinted on the material. The item is then sent on a conveyor belt through a heat-tunnel. This curing process ensures that the inks dry quickly so that they materials can be stacked or packaged. Properly cured inks will remain on the printed substrate even under harsh conditions. There are a variety of ways that the screen can be masked. The most straightforward way is to apply masking fluid directly on the screen. This technique is suitable for simple one or two color graphics but is ineffective for more complex prints. 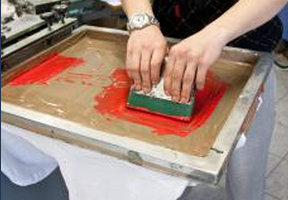 For multicolor jobs, screen-printers often use photosensitive emulsions. First, the design is created on a clear piece of plastic film. A photosensitive coating is applied to the entire surface of the screen and then dried. The film is placed on the prepared screen and they are exposed to bright light. After a period of time, the exposed areas can be washed off the screen with water, which makes the screen ready to print. The photo above shows the most basic components of a single color screen printing setup. The screen is tightly stretched around the frame, which in this case is made out of wood; the blue emulsion is dried on the screen and serves as the mask. The squeegee is nothing more than a strip of rigid rubber mounted in a wooden handle. To begin the printing process, the operator positions the screen directly on top the item to be printed. Next, ink is be applied to the area directly above the unmasked logo, and the squeegee is used to press the ink through to the substrate. As the operator firmly presses down with the squeegee, it is slid along the surface to ensure that ink penetrates through all areas of the unmasked logo. If additional colors are required, the process is repeated with additional screens. When finished, the screen is removed and the printed item is ready for curing.